Are you going to dress up as a couple for Halloween this year? Because Halloween falls on a Friday, retailers are predicting a busier than usual last minute rush to buy costumes. Don’t stress and wait until the last minute! Look around the house and see what you already have and then get what you need now so you won’t have to pay for rush shipping or settle for left-overs. We have put together 8 easy costume ideas. You can get an entire costume or just some accessories, but now is the time! Bacon & Eggs Couple – Time to play the “Goes together like…” parlor game. Pick Eggs & Bacon since bacon is having quite a moment. Get the Bacon & Eggs couple’s costume set at Kohls.com. Which Halloween costume combo is your favorite? 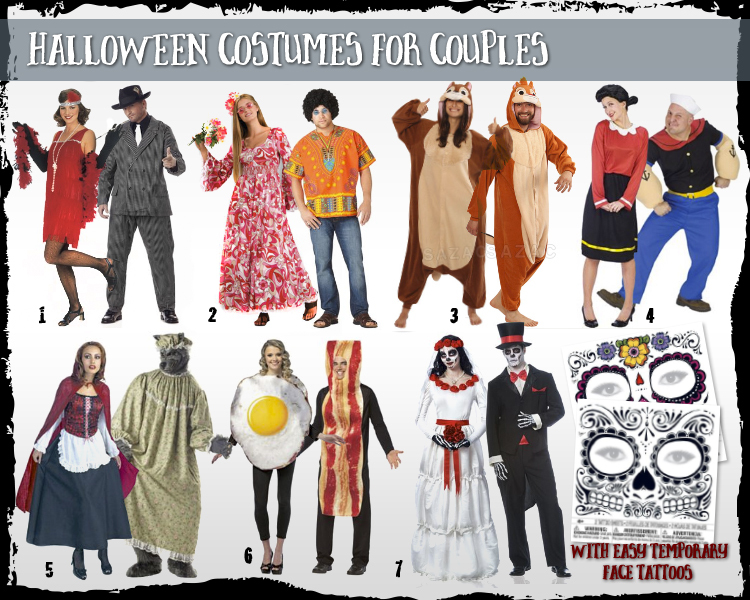 Do you have a different idea for couples costumes to share? We welcome your creative ideas!